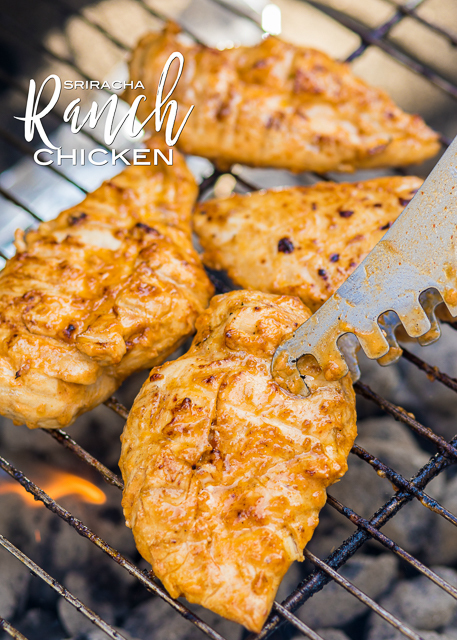 Sriracha Ranch Grilled Chicken Recipe - chicken marinated in olive oil, Ranch dressing, Worcestershire, Sriracha, salt, lemon and vinegar. SOOOO good. We always double the recipe for leftovers. 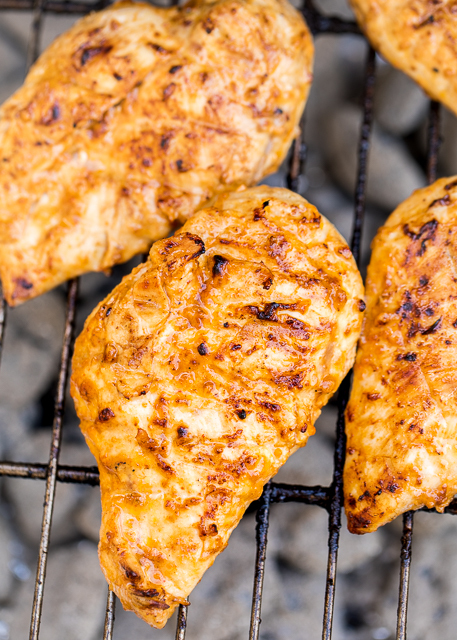 Our favorite chicken marinade is the Rosemary Ranch Chicken on the blog. 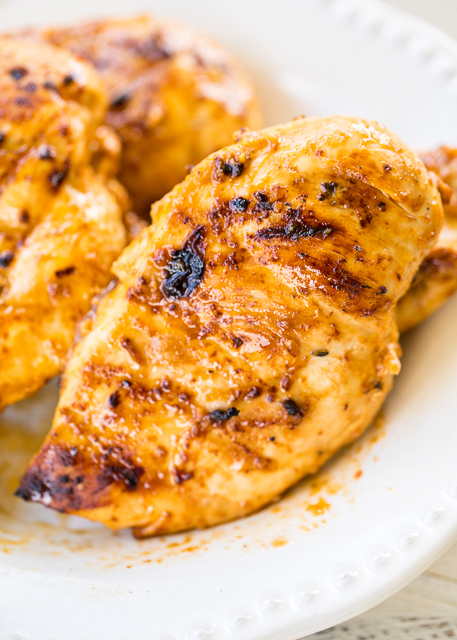 It has great flavor and keeps the chicken nice and juicy! I like to swap out the rosemary for other flavors. This time I swapped the rosemary for Sriracha. I made this a few time with varying amounts of Sriracha. I started with 2 teaspoons, but it didn't have enough kick or Sriracha flavor. I decided to really bump it up and use 2 Tablespoons of Sriracha. It had great flavor and barely any heat. Perfect for those who don't like spicy food. We like spicy food, so I may try 3 Tablespoons of Sriracha next time. In a medium bowl, stir together the olive oil, ranch dressing, Worcestershire sauce, Sriracha, salt, lemon juice, white vinegar, pepper, and sugar. Pound chicken breast to an even thickness. Place chicken in the gallon size ziplock bag, pour marinade over chicken and stir to coat with the marinade. Cover and refrigerate for at least 8 hours (all day). Ohhhh Steph! This is RIGHT up my alley and perfect for a Wednesday night grill! :) Recipe jotted down and the guys in my house are already excited about it!! All I can say is AMAZING. I used thighs instead of breasts (thats what I had on hand) and it was oooh so good. This chicken was phenomenal, so flavorful and juicy! I did not have bottled ranch dressing but had a bottle of the Hidden Valley powder so I made my own dressing and used that. I also went with the 3 tbsp of Sriracha and felt like it had the perfect amount of kick. I already have plans to bring this chicken to a 4th of July BBQ. Thanks! Can you clarify in your recipes when using ranch dressing if it is the powder mix or prepared dressing? Thanks! I think this one is prepared, right? Made this last night and it was a huge hit at our house. We cut the chicken breasts into chunks and made kabobs. I didn't have any vinegar so I just left it out and it still turned out great. So good, definitely a keeper recipe. Thanks for sharing! what would you serve for sides with this? We're going to try out the recipe next week!